It’s been a whirlwind of a time since I last wrote here, some big life changes are coming for me and my mind has been filled with confusion. I’ve been having a lot of mixed feelings about life and how things sometimes are out of our hands (aren’t they always? isn’t control an illusion, anyway?). Last week we had a long weekend because of Thanksgiving (yes, whacky Canadians celebrate it on a different date than the US) and due to the surprisingly good weather for October, on Monday I decided to have what may possibly be one of my last mountain bike ride of this season. I love mountain biking and the alone time it gives me. 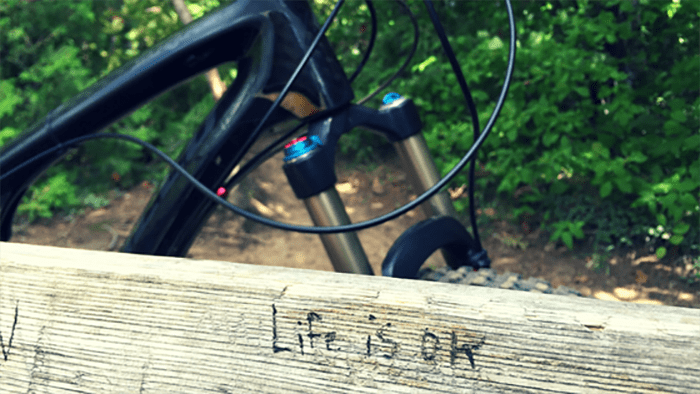 Riding in the woods gives me space to reminisce and reflect on life and my feelings, and this time was no exception. Maybe it’s because I enjoy it that much, but it always amazes me how much riding a bike is, in many ways, like dealing with the challenges in life. Rides are often full of drops, jumps, and scary moments. Parts in which you need to use your balance, keep looking ahead, let go of the brakes, and just forget about everything except right now. If you do that, don’t hesitate and tackle things with confidence, most of the times you can ride over anything. But, of course, there’s always the mind, and how you feel that particular day has a lot of impact into what you’re able to do. Some drop that you killed on a previous ride for some reason looks impossible today, so you pull the brakes and hit the drop with hesitation. On those times, you’re lucky to not end up on the ground, or worse. Why does something that I’ve done a dozen times before looks impossible and scary today? The only answer I can come up is fear of failure. Times when I’m feeling insecure, in which things in life are not going the way I expected them to, are often when this happens to me. Times when fear and overthinking takeover. There’s so much I need to unlearn to get rid of those fears, so much programming to change. It’s an everyday effort for me. Most days I’m fine, enjoy living one day at a time, but others I start over thinking and worrying about what some people may think, about what’s going to happen in the future, comparing myself with others, and it all comes crashing down. Which is where self-doubt comes in. Don’t speak to that girl because what if she doesn’t like me, don’t get that tattoo because who knows what’s going to happen in my life in five years, don’t make that jump because what if I fall and break my arm. When it comes to fear, there’s always a ‘what if’. I keep telling myself that if I had a million dollars, I could finally stop worrying and overthinking so much—don’t have to think about anything or anyone, but in the end, it’s all B.S. I tell myself to justify not facing those fears, not doing things. The truth is that I’m often too worried about tomorrow (literally and figuratively) to actually enjoy today. Especially in recent times, where my expectations and reality have differed greatly. Fear of failure has been a big factor in my life since forever. I’ve come to overcome it to some extent in the past few years, and every day I work to be better. At life, at living it, at letting things go, and at how I relate and react to people and situations. At seeing things I cling to for what they really are: a nightmare of my own making that causes me worry, insecurity, tension, anxiety, fear, and unhappiness. Still, some days I have a very hard time remembering this, that it’s all in my mind. #goals #lifegoals ▪️▪️▪️ #Repost @christmasabbott with @repostapp ・・・ Best 5 To Do List of all time. How powerful this could be for anyone daring enough to try it. Number 4 & 5 really are game changers. Dare greatly. Dare to be YOU. In the end, this may not be the best of all possible worlds, but it is the one I belong to. The one where I’ve have learned that the important things in life like flow, joy, interaction, purpose, love and, ultimately, happiness, do not depend on external factors and attachments to people or situations. In the days that I do remember this, well those are the times when all the worry and the want get washed away, and when I appreciate the beautiful grace of every moment I get to be alive. When I realize that yes, life is most definitely OK. I rarely, if ever, have expressed these feelings of mine with this frankness. So if you’ve ever felt this way, or even if it’s just me and I’m completely fucked up, do let me know by commenting or contacting me.